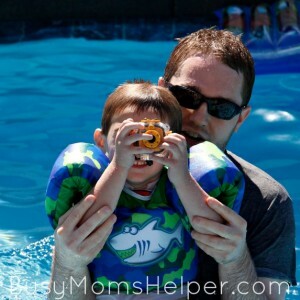 I received a free VTech® Kidizoom® Action Cam to facilitate this review. All opinions and ideas are mine alone. I’m a blogger (obviously), so my kids often see me with a camera, whether it’s my DSLR or my phone. They like to get in on the action, and have shown a major interest in photographing and recording their own adventures, creations and life. So I was THRILLED to try out this new product hitting shelves, and it turned out to be My New Favorite Gadget for Kids! And guess what? You have TWO chances to win one for your family! Contains affiliate links that support this blog at no extra cost to you. See my disclosure for more info. Although I occasionally let them use my gear, it’s hesitantly and with great supervision because I don’t want it broken or damaged. Luckily, the new VTech®Kidizoom® Action Cam is child-friendly and withstands drops and bumps. You can even have your choice of yellow/black or purple colors to match your kids’ personality! It’s even eligible for Prime shipping on Amazon! Our recent vacation to California seemed the perfect opportunity to test it out, including it’s waterproof case for underwater adventures, mounting accessories for bikes and scooters, and a wrist strap. They had a blast with it – and I really enjoyed going through all of their images and videos. It did take an initial ‘lesson’ to get them use to the buttons, and teaching them NOT to keep their finger in front of the lens, but after that they were on their own! One thing they never really got when they used my stuff was their freedom – entirely what THEY wanted to photograph, from their own perspective. At our rental house pool, they did a lot of close-ups for the beach toys – which makes me realize how big certain things must seem to them compared to us. They also REALLY like to get close to people! The quality of the pictures, even with the waterproof casing, was actually really great! Our kids from age 4 on up to the bigger girls all loved taking turns with it, and plan to make scrapbooks of their own footage from our trip. While walking Downtown Disney, they captured a lot of what most interested them – and it turned out it was things I hadn’t really noticed myself! We also let them use it during the new Paint the Night Parade at Disneyland, and although it wasn’t the best at dark night-time pictures with bright, moving lights – it did surprisingly well. The VTech®Kidizoom® Action Cam features three built-in games, stop motion and time-lapse options, as well as special effects including customized photo frames and filters. And yes, it got banged around TONS with the kiddos, especially in the parks and while swimming (they took it down the slide so many times I lost count) and is still top-notch condition. Seriously, it’s a sturdy beast! As far as cost, it’s priced perfectly – in my opinion at least (Ages 4+ years, MSRP: $59.99) or check the great prices available on Amazon! This is the perfect holiday gift, so get a jump start on your shopping this year! This fall, VTech will also be hosting the Action Cam Back-In-School Contest in which parents can upload a photo or video of their child participating in their favorite sport or after school activity for a chance to win a Kidizoom Action Cam of their very own! So go have fun, take some pictures or a video, and send it in!